Modular kitchens have brought an enormous change in kitchen design. With latest technologies, good organization system, sleek designs, stylish cabinets and sufficient storage facilities, modular kitchens have proved to be of great convenience and comfort to homeowners. Their efficiency has made cooking a joyful experience. It is the modern-day trendy and adorable modular kitchen accessories which have simplified day-to-day cooking. They are used in kitchen design when one needs to store large amounts of groceries or items having long shelf and storage life. 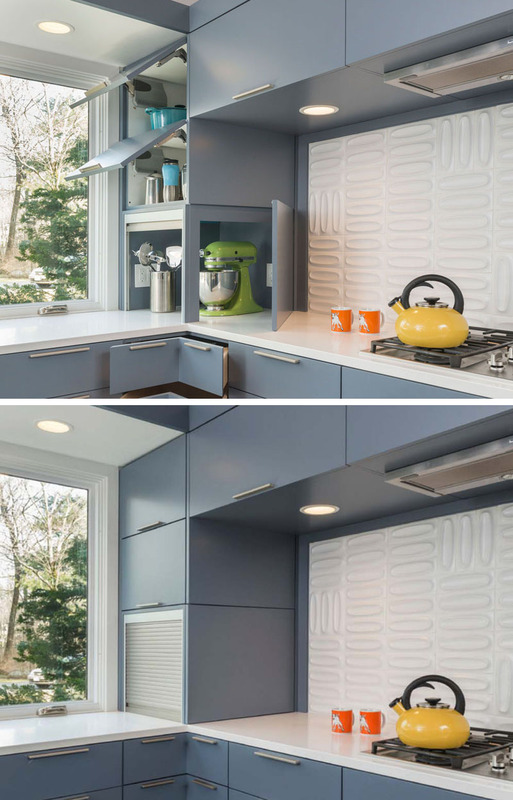 These multi-functional modular kitchen accessories provide an ingenious use and utilize spaces in vertical order acting like a pantry that does not have one. It does not have to be necessarily huge. Regular-sized tall units can make a big and meaningful difference to the space while dealing with space-related issues. These units gives the space a clean and seamless look while storing wide range of items from oil and seasonings, crunchies and munchies and many more in various sized drawers and shelves. 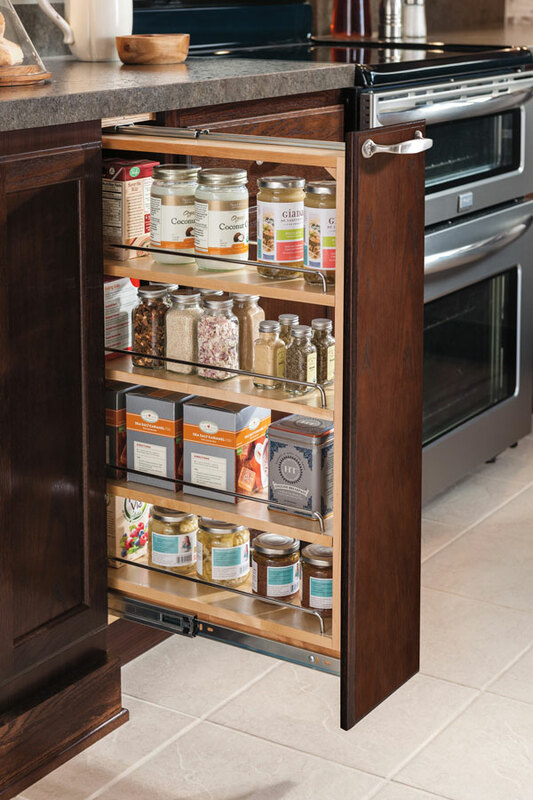 The camouflaged kitchen storage protects the items from unwanted heat, sunlight and moisture. Drawer systems are best suitable modular kitchen accessories when the concept of your storage items is decided to go under your cooking platform. They are user-friendly, as during the preparation of meal, you do not have to run from one end to the other. The ingredients are readily available in the cooking range of the drawer inserts. They can be customized using unique hardware, custom door fronts, etc. Generally, corners in kitchens go unused. Within this restricted corner space, drawers are often installed cross-wise into the kitchen corners that offer an innovative solution. They are fully retractable having kidney-shaped pull out shelves that rotate beyond the 90 degrees as shown below. Above image shows deep, diagonal drawers making good use of the corner space. They are sometimes fastened with a roll out fixings. Above two mentioned layout of drawers are deeper from inside, hence allowing to store big kitchen essentials such as silverware, stainless steel pots and various other utensils quite easily. They also serve as a mini pantry in a kitchen where homeowners and guests can help themselves. There is no smartness to keep knives, forks, knives, rolling pins and other sharp instruments loose in the drawers, which can hurt anyone using the kitchen. So, they all need to be arranged in an organized manner. Cutlery-trays are provided with knife cavities/inserts. This can help you well-arrange and make a fine display of knives/forks as shown in above image. They are generally available in a variety of materials such as metal, wood and PVC. Areas such as next to electrical appliances and refrigerators can be kept for open shelves to give a kitchen an uplifting mood and also it becomes easily accessible to the user along with aesthetics. Neatly organized and clutter-free kitchen gives a sense of happiness to the homeowner/kitchen user. The feeling is fulfilled by the role of the appliance garages/counters. They are used for the purpose of storing your blender, toaster and mixer at a suitable distance to allow for efficient and hassle-free cooking to the users. It lets you easily see what is stored in the front rows of jars. Due to its dual purpose nature, glass shelves are regarded as one of the finest kitchen accessories in terms of décor as well as function. 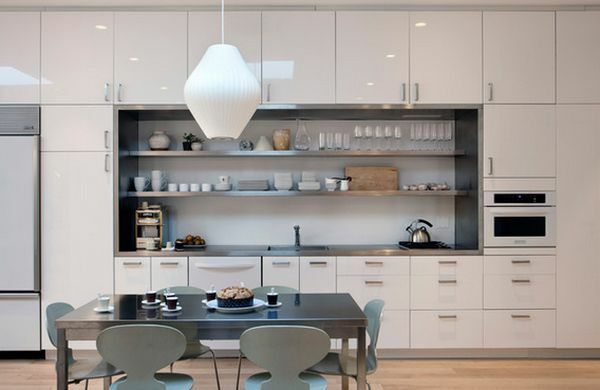 Glass shelves look eye-catching in a well-appointed kitchen. An exciting and attractive effect can be created by providing tinted glass or translucent glass. Modular kitchen accessories are the important parts without which the functioning of the kitchen is really impossible or difficult until and unless you don’t come to know how much they help with the ease in cooking and organization of the kitchen space. These modular kitchen accessories take care of the mess and chaos of the kitchen utensils and help in making the cooking process in your kitchen much more efficient and joyful.